E51 is the latest cell phone to be released under the Nokia smart phone series. Check out the review and features of Nokia E 51 mobile phone. 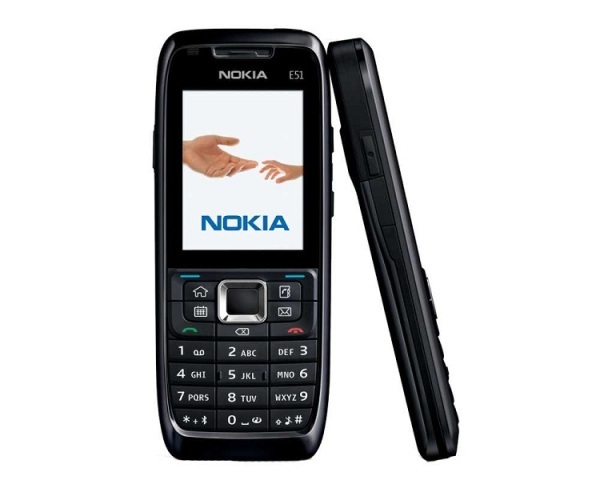 The new member to join the E-series of Nokia is the Nokia E51, launched in November 2007. The second UMTS / HSDPA dual band mobile to be launched by Nokia, E51 is a smart phone that comes packed with Symbian OS. With compact features, excellent communication skills, a comfortable and usable keyboard, sleek looks and stylish design, the cell phone promises to be the perfect all rounder. The mobile came out in November 2007 and is priced at somewhere around Rs 12,500. Nokia E51 promises to deliver as much on look as on features. With a thickness of 12 mm, the mobile phone is amongst the thinnest smart phone in the E-series, second only to the E61i that has a thickness of 0.5 mm. However, this does not mean that the phone has lost the sturdy appeal. Infact, the best part of E51 is that it feels solid in hand, while looking sleek in appearance. The screen is readable even in bright outdoor conditions and the keypad is very easy to operate and maneuver. The 2 megapixel camera of Nokia E51 makes sure you never ever miss a memorable moment of your life again. The clarity is quite good, through not excellent, and the flash pretty decent. The only problem is that there is no front camera in the phone. As for the music, the phone supports MP3/AAC/video player MP3/AAC/video player. The expandable memory makes sure that you never ever have to go out with your favorite tunes by your side. The built in FM radio enables you to tune into your favorite station as and when you want. Like all the other smart phones, Nokia E51 comes equipped with GPRS (Class 32), EDGE (Class 32), HSCSD and WLAN. Apart from Bluetooth and infrared, it also has WAP 2.0/xHTML browser. It works on both 2G (GSM 850 / 900 / 1800 / 1900) and 3G (HSDPA 850 / 2100) network. Symbian OS and MIDP 2.0 make sure that your phone works to your best advantage. Standard Li-Ion battery of the mobile phone, with a talk time of up to 4 h 20 min, only adds to its appeal amongst the customers.